Where did Malala Yousafzai grow up? Malala Yousafzai was born in the Swat Valley region of Pakistan on July 12, 1997. She grew up in the city of Mingora with her two younger brothers. Her family practiced the religion of Islam and was part of an ethnic group known as the Pashtuns. Malala's early childhood was one of happiness and peace. Her father was a teacher who ran several schools. Many Pakistani girls did not attend school, but this was not the case with Malala. Her father ran a school for girls where Malala attended. Malala loved learning and going to school. She dreamt of one day becoming a teacher, a doctor, or a politician. She was a bright girl. She learned three different languages including Pashto, English, and Urdu. Her father always encouraged her to learn more and taught her that she could accomplish anything. Around the time Malala was ten years old, the Taliban began to take over the region where she lived. The Taliban were strict Muslims who demanded that all people follow Islamic Sharia law. They said that women were to stay at home. If a woman left her home, she was to wear a burqa (a garment that covers the body, head, and face) and must be accompanied by a male relative. As the Taliban gained more control, they began to enforce new laws. Women would not be allowed to vote or have jobs. There would be no dancing, television, movies, or music. Eventually, the Taliban demanded that the girls schools be shut down. Girls schools that were not shut down were burned or destroyed. About this time, Malala's father was approached by the BBC to get a female student to write about her life under Taliban rule. Despite being worried about the safety of his family, Malala's father agreed to let Malala write a blog for the BBC. The blog was called Diary of a Pakistani Schoolgirl. 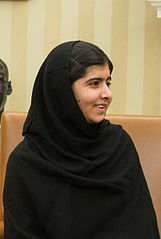 Malala wrote under the pen name "Gul Makai", a heroine from a Pashtun folktale. Malala soon became famous for writing her blog. She also began to speak in public about the treatment of the Taliban. War broke out in the Swat region as the Pakistani government began to fight back against the Taliban. Eventually, the government took back control of the area and Malala was able to return to school. The Taliban were not happy with Malala. Even though the fighting had ended and the schools were open again, there were still Taliban throughout the city. Malala was told to stop speaking out and received numerous death threats. One day after school, on October 9, 2012, Malala was taking the bus home. Suddenly, a man with a gun boarded the bus. He asked "Who is Malala?" and said he would kill them all if they didn't tell him. Then he shot Malala. The bullet struck Malala in the head and she was very sick. She woke up a week later in a hospital in England. The doctors weren't sure if she would live or have brain damage, but Malala had survived. She still had to have a number of surgeries, but was attending school again six months later. Getting shot didn't stop Malala. On her sixteenth birthday Malala gave a speech to the United Nations. In the speech she spoke about wanting all girls to get an education. She didn't want revenge or violence on the Taliban (even the man who shot her), she just wanted peace and opportunity for all. She was named after a famous Afghani poet and warrior named Malalai of Maiwand. Malala was the youngest person to receive the Nobel Peace Prize. She was in chemistry class when she found out. Kailash Satyarthi shared the Nobel Peace Prize with Malala. He fought against child labor and slavery in India. The United Nations named July 12th as "World Malala Day." She once said "When the whole world is silent, even one voice becomes powerful."